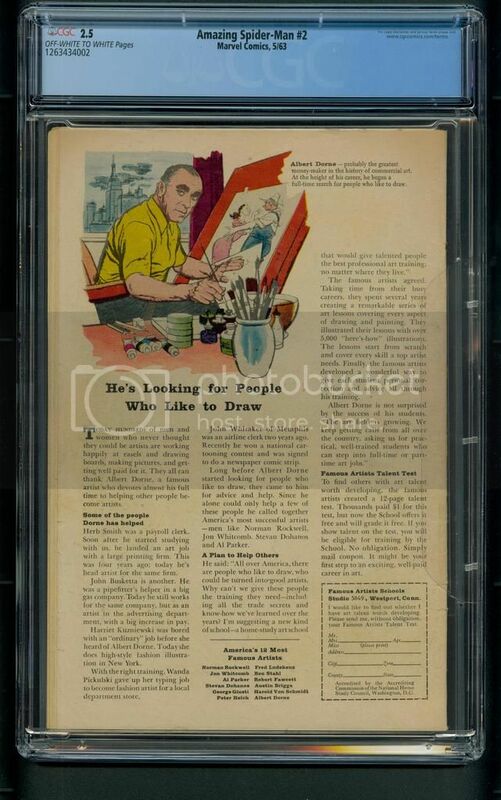 (1963) MARVEL COMICS CGC Header & Full Front Cover Full Back Cover ITEM DESCRIPTION 1st appearance of the Vulture (Adrian Toomes) and the Terrible Tinkerer (Phineas Mason). 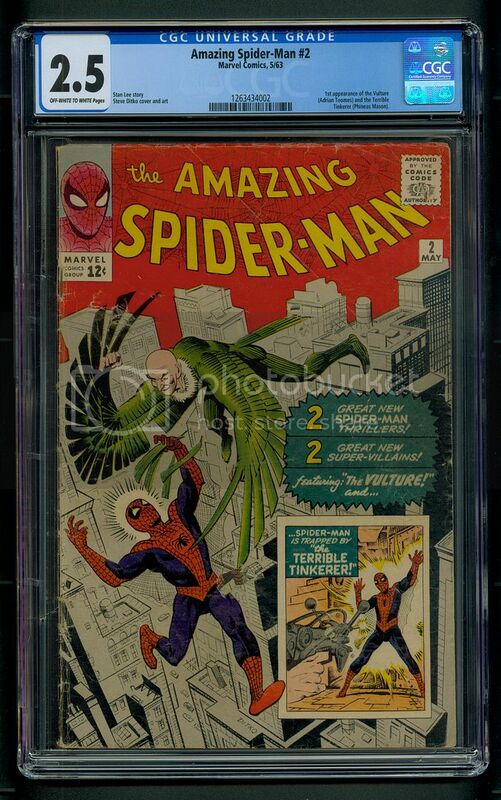 Stan Lee - Story Steve Ditko - Art Steve Ditko - Cover CGC Graded 2.5 ~ OFF-WHITE TO WHITE PAGES! ~ Brand New Case ~ Scans have been provided for a visual condition of this item. Please inquire if you have any concerns or questions about this item before purchasing. Thank you SHIPPING INFORMATION FOR THIS ITEM We offer combined shipping for multiple items purchased! THIS ITEM SHIPS IN THE U.S. USING USPS PRIORITY MAIL WITH SIGNATURE CONFIRMATION & INTERNATIONALLY USING USPS EXPRESS MAIL WITH TRACKING. NOTE: INTERNATIONAL CUSTOMERS PLEASE BE AWARE OF THE CUSTOMS CHARGES IMPOSED IN YOUR COUNTRY BEFORE PURCHASING. THE VALUE OF THE "MERCHANDISE" WILL BE DECLARED ON THE CUSTOMS FORM. NO EXCEPTIONS. THIS EXTRA CHARGE IS THE RESPONSIBILITY OF THE INTERNATIONAL CUSTOMER. PAYPAL USERS: We can only send your merchandise to the "Paypal" confirmed address provided by "Ebay" and "Paypal". Please do not ask for merchandise to be sent to other addresses other than the "Paypal" confirmed address provided. A confirmed "Paypal" address cannot be changed during the transaction. Such an action can result in the cancellation of your transaction. Thank you for your cooperation. INTERNATIONAL CUSTOMERS: We value your business and enjoy selling around the world. However, you are responsible for customs charges in your country. Please be aware of those extra charges when purchasing our merchandise. As retailers we must declare as "merchandise" and place a value on all merchandise sold internationally. Thank you. Click the "Sign Up For Store Newsletter" link near the top of this page to receive weekly e-mails featuring our newly listed items! THANKS FOR LOOKING!